Hydrologic silver-impregnated ceramic water purifiers (CWPs) have been proven to remove at least 99.99% of harmful bacteria from drinking water. The CWP fits snugly into the top of a specially designed plastic container with a lid to protect against recontamination. Hydrologic CWPs are manufactured in Cambodia using locally available resources and skills. When filled with untreated water, the CWP percolates water through the ceramic pot by gravity filtration at a typical rate of 1-3 liters per hour. Bacteria down to 0.2μm are physically blocked and also killed by the silver. Each unit is able to store up to 12 liters of clean drinking water. Since the CWP’s filters are enclosed in food-grade plastic containers, they ensure that treated water is safely and properly stored. Water treated by other methods in Cambodia (by boiling, for instance) is often kept in open containers and is easily re-infected. Hydrologic filters dispense water from a tap, increasing their effectiveness and ease of use. Hydrologic Social Enterprise currently produces two CWP models to target different market segments, a basic CWP and a larger model with extra storage volume and more attractive external styling. 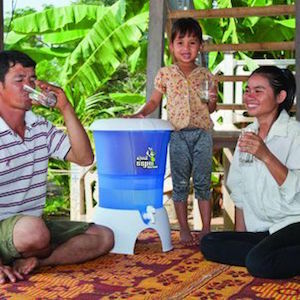 When Hydrologic Social Enterprise was founded in 2009, 66% of Cambodian households (18 million people) lacked access to safe drinking water. These conditions resulted in 10 million cases of diarrhea and 10,000 deaths per year. Young children are particularly vulnerable and water-borne disease was a major contributor to Cambodia’s under-five mortality (88/1000 live births), one of the highest rates in Asia (UNICEF 2009). A 2007 UNICEF study in Cambodia showed that use of CWPs resulted in a 46% reduction in diarrheal disease. Families using CWPs can also expect significant economic benefits. A 2010 study by iDE found that households using CWPs saved US$73 per year on medical bills and on lost wages related to diarrhea, compared to people who do not treat their water.